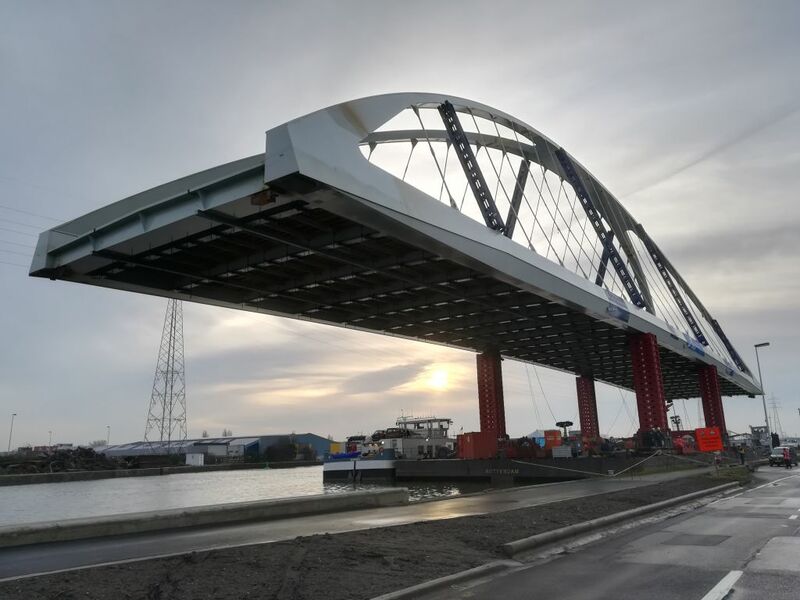 The Ale company recently loaded-out and installed the « Brug van den Azijn » bridge over the Albert channel of Antwerp in Belgium. Measuring 124m long and weighing 1200t, it had been in first place transported by barge from Wondelgem to Antwerp. Then, the structure had been loaded-in on a site near the final location, where the bridge’s arches were assembled. The full bridge has been lifted by the Mega Jack 800 at 8m high to position it higher than the abutments, and then by 3m for its final position. Tom Van De Locht, Project Engineer, stated the Mega Jack 800 was essential for the smooth operation because thanks to this system « the operational time was reduced, and it was easily integrated on site because of its small footprint and compatibility with our other services ».